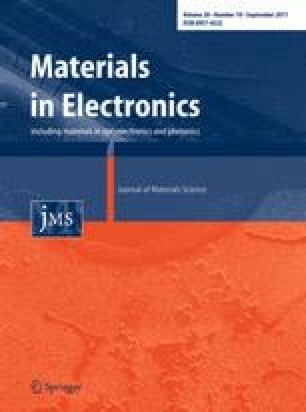 Au/n-Si(MS) and Au/(0.07graphene-PVA)/n-Si(MPS) structures were fabricated on the same wafer at identical conditions and their electrical characteristics have been investigated by using current–voltage (I–V) and capacitance/conductance–voltage(C/G–V) measurements at room temperature. The rectifying rate(RR at ±5 V), barrier height(Φ Bo ) and surface states(N ss ) (at 0.5 eV) for MS structure were found from the I–V measurements as 1.96 × 103, 0.757 eV and 9.67 × 1014 eV−1 cm−2 for MS whereas those for MPS structure were 9.67 × 105, 0.790 eV and 1.04 × 1013 eV−1 cm−2, respectively. The reverse current mechanisms were also discussed by considering Poole–Frenkel and Schottky emissions. The values of RR and N ss of MPS structure are 493.37 times higher and 92.98 times lower than these values of MS structure. The values of doping atoms (N D ), Fermi energy (E F ) and BH were extracted from the reverse bias C −2 –V characteristics at 1 MHz as 2.42 × 1015 cm−3, 0.260 and 0.994 eV for the MS and 0.856 × 1015 cm−3, 0.234 and 0.828 eV for the MPS structures, respectively. These results show that the use of (graphene-PVA) interlayer improves the performance of MS structure and so it may be good alternative to replace the conventional SiO2 due to reduce the number of oxygen vacancies and yields low density of N ss , and increase the BH. This study was supported by Gazi University Scientific Research Project (Project Number: GU-BAP. 06/201613).